Candidates age should be between 18-25 years as on 01-01-2014. Age relaxations is applicable as per rules. Candidates should possess HSLC/ Class X passed from a recognized Board. Candidates will be selected based on Physical Standards Tests (PST), Physical Efficiency Tests (PET), Written Test, Extra-curricular activities and special skills. 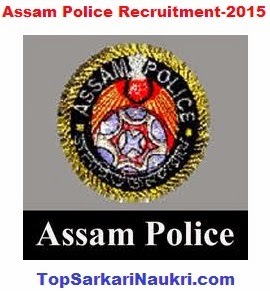 Eligible candidates may apply online through the website www.assampolice.gov.in from 26-12-2014 to 25-01-2015. Candidates can also submit paper applications in Standard application form at the office of the Superintendent of Police of the district from which the candidates wish to appear in the Selection Tests. 1. Log on through the website www.assampolice.gov.in. 2. Click on “Recruitment of Armed Branch Constables”. 5. Candidates applying online will get an acknowledgment slip with an ID number which can be printed and will also get the information through SMS and email. Starting Date to Apply Online: 26-12-2014. Last Date to Apply Online: 25-01-2015.